No matter what your lubrication needs are, you can turn to Clarion Lubricants. We stock a wide variety of oils and additives that include mineral oil, compressor oil and synthetic gear lubricant in several viscosities to fit any application. Clarion oils include a number of food grade greases, gear oils, and mineral oils to keep your processing equipment up and running. In addition, if you require additives for use in environmentally challenging situations, our green lubricants will fit your needs. 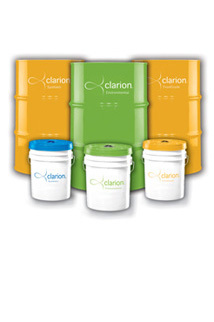 On this page, you can view the Material Safety Data Sheets for various Clarion products. If you have any questions, please contact us. One of our knowledgeable representatives will be happy to assist you in fulfilling your Clarion oil or grease needs.